Tayla Jones raced her Husqvarna TC125 and broke into the top-10 overall at the Rocky Crusher Sprint Enduro. 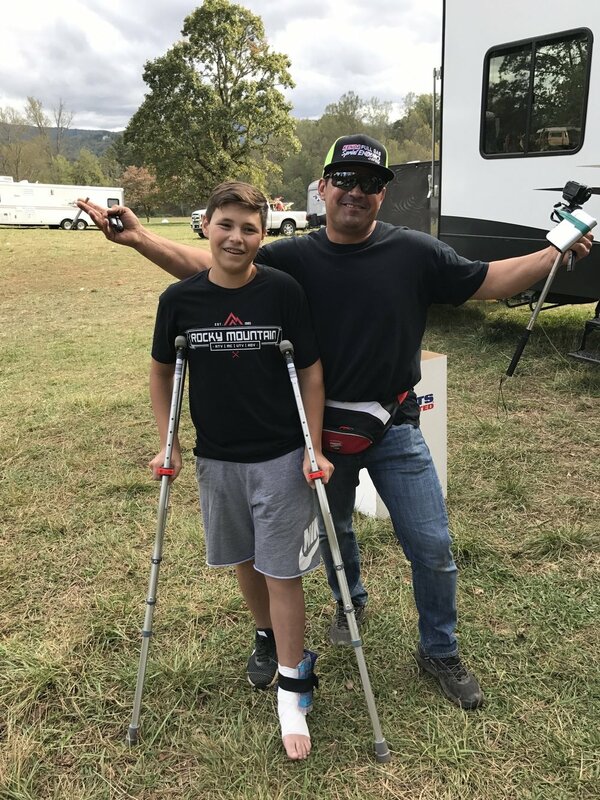 YOUNG HARRIS, Ga. (October 23, 2017) – The Kenda Full Gas Sprint Enduro (FGSE) series, presented by PRI Powersports Insurance, continued this past weekend, October 21 and 22, with the Rock Crusher Sprint Enduro. The unique property featured part of the track in North Carolina and the other in Georgia, while boasting perfect racing conditions for Rocky Mountain ATV*MC/KR4/Husqvarna team members who took part in the penultimate round. With the Women’s Pro championship already in hand, Tayla Jones elected to change up her program and race her Husqvarna TC125. Jones won 10 of the 12 tests and took her eighth win of the season 58-seconds ahead of her closest competition. Jones had set a goal for herself at the beginning of the season to place inside the top-10. After sitting in 11th at the conclusion of Saturday, Jones pushed even harder on Sunday and can now mark that goal off her list with a tenth overall placement. Tayla Jones celebrates another Women's Pro victory on the podium. Chase Sweda raced a 2017 Husqvarna FC250 this past weekend at the Rock Crusher Sprint Enduro. Chase Sweda also switched up bikes and ran a 2017 Husqvarna FC250 this past weekend at the Rock Crusher Sprint Enduro. Sweda won three tests throught the course of the weekend, and never finished outside of the top-five. Sweda raced his way to third – his best finish to date – and accredits his win to the power and feel of his new ride. Maximo Gutierrez suffered a ankle injury on Sunday and was forced to drop out of the race. Unfortunately, Maximo Gutierrez hurt his ankle in one of the tests on Sunday forcing him to drop out of the event early. His impressive results from Saturday allowed him to salvage fifth place in the Juniors 12-17 class. The Rocky Mountain ATV*MC/KR4/Husqvarna Team resumes racing this weekend with the season finale Ironman GNCC in Crawfordsville, Indiana. FGSE action picks back up in three weeks, November 11 and 12, with the Big Buck Sprint Enduro in Union, South Carolina.